No longer sold by Zara. 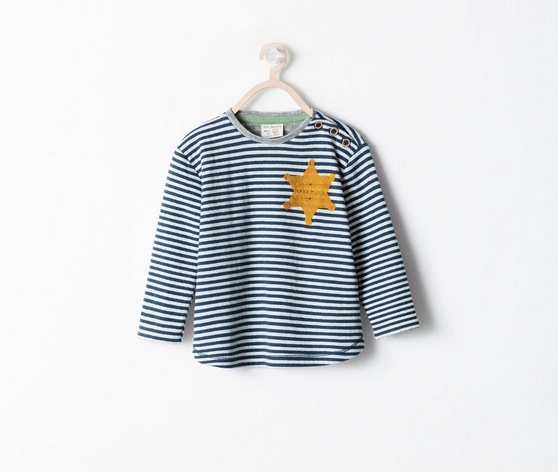 Zara has been busy apologizing today after shoppers noticed a blue-and-white horizontally striped children’s pajama top with a yellow sheriff’s star reminded them of something else, something a bit more controversial than an officer of the law — the uniform Nazis forced Jewish concentration camp prisoners to wear during the Holocaust. The newspaper ran a photo of Auschwitz prisoners wearing green-and-white vertically striped jackets, bearing the yellow star with the German word “Jude” for Jew in on its sleeve in comparison. Others joined in to decry the shirt on Twitter, among them, many questioning what in the heck Zara was thinking. Zara’s parent company Inditex tells Reuters that the resemblance was unintentional, and that the shirt was for sale online in three countries but not in Israel. This isn’t the first time retailers have found themselves scrambling to apologize over tone-deaf design moves, either. Someday they’ll learn… right?